Get to know the new 2020 GT500. It might be hard to believe, but the S550 is headed for its fifth birthday, and Ford Performance is celebrating that milestone in style. Marking the occasion in the 2020 model year is the 700-plus-horsepower Shelby GT500. The Blue Oval’s latest halo-performance pony car brings with it a whole host of improvements, many of which were borrowed from the Mustang GT4 road-racing program. 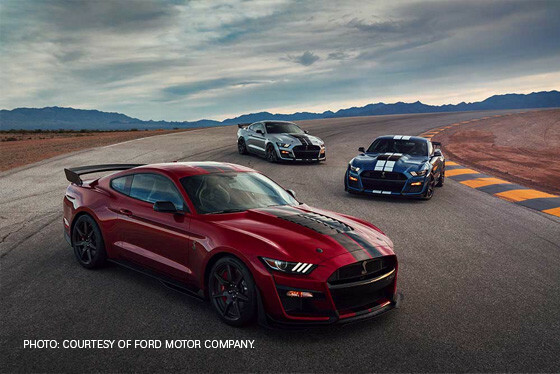 Helping this top-dog GT500 beat up on far more expensive supercars is a TVS-supercharged, 5.2-liter engine, but the real game-changer is a departure from a manual transmission in favor of a TREMEC seven-speed dual-clutch transmission. Not only does this high-tech gearbox bang off shifts in as little as 100 milliseconds, but it also enables integration of several drive modes — normal, slippery, sport, drag and track — as well as performance options, like a line-lock and rpm-selectable launch control. To harness that performance, engineers pushed the S550 platform even further with aerodynamics developed to improve its high-speed stability, and a second-generation MagneRide suspension that engineers improved to put this car’s impressive torque and horsepower to the ground. The 2020 Shelby GT500 will definitely be an impressive machine right off the dealer lot, as it has the potential to run 10-second quarter mile elapsed times in factory form. However, rest assured that Steeda will offer a series of upgrades that will maximize Ford’s most powerful Mustang yet. For all your GT500 and 1979 & Up Mustang needs, head to Steeda.com or give us a call to speak with a performance expert today at (800) 950-0774. Are you looking to upgrade your S550 Mustang so it stacks up to the new GT500? Then make sure you see our entire selection of 2015-2019 S550 Mustang performance parts.